When I was about fourteen, my best friend Charlotte was jealous when I went on a summer vacation to Europe with my family. When I got back I never called her, even though I kept telling myself I should. The reason I didn’t call had nothing to do with her jealousy, or my feelings for her, I’m simply afflicted with social anxiety. Picking up the phone has always been, and continues to be, extremely difficult for me, even if I deeply care about the person on the other end of the line. I figured that when we got back to school in the fall, our friendship would pick up where it had left off. I was wrong. Instead of welcoming me back with open arms, Charlotte ghosted me, or did the 1990 version thereof. She basically ignored me until I got the hint and stopped trying to talk to her. She had found new, cooler, friends to hang out with and I wasn’t worthy anymore. I had been friend-dumped. This wasn’t surprising to me. She’d always been a bit on the shallow side and she’d clearly found a step up by ingratiating herself with the cool kids over the summer. What’s more interesting is that being friend-dumped wasn’t particularly distressing for me. I was embarrassed, but I wasn’t really upset at losing Charlotte. When I say she was my best friend, I mean it in the sense that she was the person I spent the most time with, not in the sense that I cared about her most, or really at all. I actually found the entire situation fascinating. That someone could be so determined to increase their social standing that they would enact such cruelty upon a one-time friend was rather intriguing to me. And I was forced to ask, as I ask again now, what exactly is friendship? I’ve heard people say that in childhood friendship is 90% proximity, but I would say that holds true at any age. We are “friends” with the people we spend most time with, and for most of us that means our schoolmates or coworkers. There’s nothing wrong with this of course, provided we have any genuine interest in these people. Google defines friend as a person whom one knows and with whom one has a bond of mutual affection, typically exclusive of sexual or family relations. So the keywords here are “mutual affection”. Did Charlotte and I have mutual affection for one another? I can’t say. I think we both used each other because of the convenience more than anything else. Neither of us had many other friends at that time. I don’t really have that many memories of her, so I’m not sure if I actually enjoyed her company, or her mine. I don’t know if I was a bad friend, or if she was. Was she being a mean girl by ghosting me or did I begin the ghosting by never calling after that summer holiday? I’m still neglectful towards my friends even today. But this isn’t due to a lack of interest so much as a lack of energy. 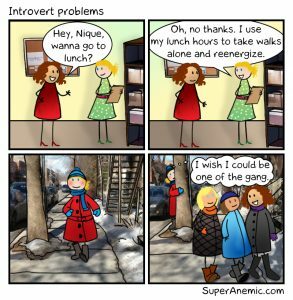 As an introvert, I only have so much energy in any given day for social interaction. A few years ago I shared an office with a woman who was going through a divorce. We became friends because of, you guessed it, proximity, and she confided in me about everything going on in her life. I didn’t mind hearing these things and I genuinely liked her as a person, but my god, was she exhausting. When she moved on to another job I didn’t bother to maintain the friendship. I still feel bad about this, and worry that she thinks I don’t like her, but honestly, I just couldn’t handle the amount of work it took to be her friend. But even when I do want to maintain friendships, I put no effort towards doing so. Social anxiety prevents me from reaching out to people, and introversion limits the amount of time I spend with them. In my adult life, I’d say my only friends are my colleagues. I like them, and care about them, and we often have lengthy conversations, but these conversations usually revolve around office gossip. Does this still count as friendship? Sometimes we get together outside of work, so that counts as friendship, right? Yet I’m also aware that these same people see each other outside of work much more often without me. Does this mean they like each other more than they like me? Perhaps. Or perhaps they’ve learned enough about me not to invite me to things I wouldn’t enjoy. I recently felt pangs of envy and self-pity when I saw two colleagues go out for lunch together, and wondered where my invite had been. But then I remembered all the times I’d turned down lunch invites and realized that I was my own worst enemy, if my goal was to be queen BFF. I reminded myself that friendship is a responsibility, and one that I usually can’t handle. So I’m a bad friend, right? Well, I guess this depends on your definition of friendship. Is a friend someone you simply hang out with, or someone you entrust with your deepest, darkest secrets? Other people have examined this issue at length. Mobinah Ahmad has categorized six levels of frienship, Jeremiah Creedon lists nineteen kinds of friends, and other articles have listed so many types that I’ve lost count and interest. Then there’s the science. Dunbar’s number suggests that humans are only capable of maintaining social relationships with 150 people, and that limit drops to five when it comes to close relationships. I must admit that while I’m extremely attentive when I’m with people one-on-one, once most people are out of my sight, they are equally out of my mind. I think back to when we were kids, and Charlotte wanted, as all teenagers do, that nebulous thing called popularity. She wanted to be at the center of a large group, or at least on its periphery because this represented success. Adolescents are naturally insecure and therefore preoccupied with what others think of them. Having a lot of friends means validation. But this need for external validation from a large social circle clearly persists into adulthood for many. For me this is the folly of choosing quantity over quality, and with Dunbar’s scale in mind, I imagine that what other people consider friendships are really just glorified acquaintances. Then again, just because I can’t handle a lot of social interaction, doesn’t mean others are similarly afflicted. 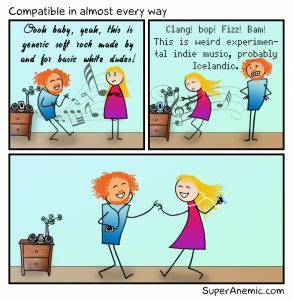 My partner, BFG (BoyFriendGuy), is an extrovert and while he doesn’t seem to need a lot of friends, he puts a baffling amount of effort into maintaining relationships with an equally baffling variety of people. I’m being flippant, as obviously these relationships aren’t baffling to him. When I ask why he stays friend with the woman who always cancels on him last minute, he explains that she’s worth it because she’s a great conversationalist when she does deign to show up. When I ask why he’s friends with the man who can’t string two words together he explains that they enjoy practising karate together. Fair enough. But I place no value on such interactions. They’re fine for someone with infinite energy but a waste of time for me. If I’m not going to be seeing someone on a regular basis I don’t see the point of investing in them. Sometimes even when I do see people on a regular basis I don’t bother to get to know them because why would I? I’ve often found, while hanging with so called friends, that most people aren’t really interested in having meaningful conversations, they are merely waiting for their turn to talk about the most mundane subject of all: themselves. (Hypocrisy alert!) But I want my friendships to have purpose. Interestingly, a day after I wrote a first draft of this post, BFG posted a video on Facebook from the Book of Life, about exactly that topic. (Scroll down for the video). Here was vindication that I’m not wrong for wanting a concrete reason to hang out with people. Don’t get me wrong; meaningless hang outs can be fun but I’m not sure I would define those interactions as friendships. For me, a true friend is someone I would die for, someone I would kill for. Some recent self-analysis has led me to the conclusion that I only have space for one such person in my life at any given time. Currently, my one true friend is BFG. I’d say there are maybe two other people who’ve been my best friends in the past, for whom I’d still bury a body no questions asked, but I don’t see them very often anymore simply because we no longer live near one another, and our lives have followed different paths. And it’s probably a good thing that I don’t see these people that often anymore, because maintaining three true friendships would be a lot of work! One of the things I really value in my one true friendship, is that it’s a relationship wherein interacting doesn’t feel like work. Which is not to say that I don’t put effort into my relationship with BFG, it’s just that I can sit in silence with him and not feel anxious about it, as I would with nearly anyone else. Even though the definition I quoted at the top of this post doesn’t want me to think of a sexual partner as a friend, I maintain that everybody should strive to make their life partner their best friend. Honestly, what is the point of sharing your life with someone if you’re not the best of friends? With this in mind I am definitely a good friend to BFG, as we are extremely well bonded and would both do anything for the other. But I am perhaps a bad friend to everyone else. If I’d been a “good friend” to Charlotte back in the day, then maybe she would have brought me along on her quest for high school popularity. If I’d been a “good friend” to my divorced coworker then I’d have been invited to her second wedding. But would my life have been enriched by high school popularity? Adolescence is when I began my journey of rejecting social norms and standards. Popularity would have only increased that pressure to conform. And do I really want to be friends with someone who is so plugged into those social norms that her second husband is a carbon copy of her first, both textbook cases of toxic masculity? The answer for this admitted elitist is no. So yeah, I’m a bad friend according to most people’s definitions. I’ll never be the one who throws parties or organizes lunch dates or shopping trips or whatever else normal people do together. If I’m invited to said events I’ll go and I’ll have fun and I’ll listen to others complain about whatever’s wrong with their spouses, (which seems to be THE topic of conversation no matter who I’m with), but I won’t commiserate, because there’s nothing wrong with my spouse. My best friend is amazeballs and so is our friendship.